If there’s one gift I still miss seeing under the Christmas tree, it’s Legos. Where to even begin with these ridiculously addicting little bricks that could bring a joy to my heart that no other toy could possibly ever bring? Well, a good place is to highlight just how truly unique Legos are. Unlike any toy, Legos bridge the gender gaps, and offer something to kids (and adults alike), something that not only expands your creativity but just makes for a crazy fun time. I can’t tell you the number of long nights I spent dumping out all the pieces of a set, and discovering a new found determination that wouldn’t let me go to bed until every brick was in its right place—those were the good times, you know, before iPads and smartphones took over our minds. I won’t stay on my soapbox for too long, as today is not meant for preaching our demise at the hands of technology, but a time to celebrate one of the greatest, and sometimes strangest toys. Because Legos, like most toys that have been around for decades, have had some weird moments throughout their history. That includes some strange partnerships with companies who you’d never envision to have a Lego set, and just some sets that truly take the weird cake. Along with that, we will make sure to praise ten sets that embrace that weirdness, well, in a good way, and offer not only some of the most creative sets but also some of the best to come from Lego. Well, without further adieu, let’s jump into it. So this isn’t so much a shot towards Nesquik, because let’s face it, that stuff might be cheap and somewhat tacky when it comes to beverages—but gosh dang is it delicious nonetheless. But when Lego and Nesquik teamed up, the collaboration resulted in an abomination that I really wish I could erase from my memory. On paper, this partnership seems just funny, and just ironic enough to work, but what resulted in what looks to be one of the worst, and certainly creepiest minifigures to date—sorry, but my future kids ain’t playing with this one. Another addition to the creepy eyes category—Yoda proves that some characters were just never meant to translate into Legos. While Yoda’s minifigure might be pretty creative, someone somewhere should’ve realized this set just looks too strange. Not to mention that his necklace resembles binoculars as if our favorite Jedi Master is prepping for some peeping, or even worse, bird watching! These type of sets are cool for the fact that you’re making a character out of individual bricks, but it just doesn't work here, not in the slightest. Sometimes you see an idea that just makes you think, “well, yeah, of course that works, those things were just meant to work.” You got your classic partnerships like PB&J, your weird yet delicious ones like avocado and jam (trust us, it’s awesome) and some that surprisingly work like Lego and the classic ship in the bottle. What we have here is quite possibly one of the best gifts for the adult in your life that loves some Legos. I’d proudly display this set on my desk or really just anywhere, as it’s just too cool. Now, before you ask, yes, my rhyming skills have inspired me to now become a rapper—so if anyone has any connections in the industry, make sure to send them my way. Now, with that out of the way, let’s talk about this set. Lego Galidor is what happens when Lego attempts to steal away some of Barbie’s audience, and now here we are with this spectacular failure. Galidor represents a period where Lego must truly feel ashamed of themselves. Whoever is responsible for this indecency to my eyes should know that they have permanently scarred me and any who have to endure this image. I mean, how? No, really, how did someone think this set was going to fly? Someone needs to one, get this guy a sandwich, and two, find him a helmet proportional to the rest of his body. A good rule of thumb is to think, would I even know what this was if they didn’t display what series this was a part of? And I’ll go ahead and answer that for you: NO! Now, no kid can say they truly played with Legos until they blend together sets and themes for the first time. Unless you're the uptight Will Ferrell from the Lego Movie, one of the best things to do with Legos is create crossovers with your sets. Lego Time Cruisers is Lego embracing this aspect of Legos and giving the fans a series that blends some of the coolest elements from different sets. This is just one of those sets that showcase the raw creative power that the creators at Lego have. Lego Time Cruisers worked so well because they combined sets under the idea that the characters were time traveling. Now, what we have here is a combination of two different sets, from two entirely different eras, making for one confusing set. Let me not contradict myself here though; combining sets is awesome, but if Lego is the one doing it, well, it better make sense. Here it just makes no sense and just makes you wonder why they did it at all. From first glance, you probably think I’ve gone crazy with this entry—“What’s the matter with this one?” you must be asking yourself. Well, just really look at this thing and tell me it wouldn’t look awful displayed pretty much anywhere. What we have here is a giant minifigure that isn’t even made of Lego, just giant plastic that’s already constructed for you. It’s just extremely obtuse. I don’t think minifigures were meant to be this enlarged and still look good. 22 The Best: Lego Batmobile With Remote-Control Functionality! Talk about a combination of really cool features—here we have a Batmobile that’s ready to traverse 2019 with its app-control functionality. That’s right: release this thing into your office or even around your house for the time of your life. As a kid who grew up in the early 2000s, it’s a shame to see remote-control devices pretty much made irrelevant today. But at least the tech has seen a huge upgrade, with us now being able to control devices with our phones, and the Batmobile has to be one of the coolest devices out there. Lego Fabuland is one set that will likely make you scratch your head as you try to make heads or tails of what it is. On one hand, it’s a kids' Lego toy that looks straight out of the Beatles Yellow Submarine movie, so that makes it kind of cool. But on the other hand, it really makes me wonder what in the world are these things?! Where are they from? What’s their point? What is going on?! These anthropomorphic characters look interesting, but their randomness can only get them so far. Well if you had the pleasure (or displeasure in my case) of seeing Star Wars Ep. VIII then you probably have some sort of an idea as to what’s going on in this set. Think back when BB-8 hijacked that walker only to make Captain Phasma look useless for the second consecutive Star Wars movie (even thinking back to this scene is giving me migraines). But I’ll leave my Ep. VIII bias at the door because regardless of what you think of the scene, it’s hilarious to see that Lego sold the walker involved, or at least, half of it. Not only about the times, you know, when Star Wars was good (yeah, all the shots fired at this point), but to the times when we all desired to play with the biggest, coolest, and most expensive sets that we probably couldn’t afford. Well, maybe the last part was just me, but the Sandcrawler was one of those sets that I always dreamed of getting. It had a stellar amount of minifigures and a vehicle that didn’t garner much attention, but looked awesome nonetheless. Many Lego fans consider this to be one of the worst remakes of a set, so let’s break down the many reasons why they might think that. For starters just look at Luigi and Guido’s hats, which are just one singular Lego piece for both. Not to mention that these characters are involved in one of Pixar’s worst movies, but I guess I’ve already rambled on enough about movies that I desperately avoid. Other than the hats, these two just look awkwardly compact compared to how they used to look in their previous set. You know, sometimes you would think that creators would look at the characters and say “Hey, maybe this is just a good first draft. I think we should come back to this later and maybe finalize it.” Just look at Seth Macfarlane’s “Larry & Steve” to get a good idea of what I’m talking about. So when you look at the little abominations, oh, I mean robots... you think, how did someone not have a similar revelation? All of these characters look bad in their own right, and translating them to Lego doesn’t help. Well, with Netflix’s Voltron series concluding, there’s really no better time to show off a set as creative and as truly awe-inspiring as this one. Lego Voltron is the stuff that childhoods are made of—it’s got the colors, it’s got the play-ability factor, and it’s surely got enough nostalgia packed into its 2321 pieces. This one might be a little too big to display on the desk, but it’s definitely something that’s worthy of being the centerpiece to your nerd cave. Upon first look, this is another that probably looks a-ok, but trust me when I say this thing is weird in the sense that it’s one of the most incomplete sets on this list. From the front, the Krusty Krab looks better and crustier than ever. But it isn’t until you get to the back where you see this set is a FRAUD only offering the front of the iconic cartoon restaurant. No grills, no cash register... even Squidward was left out (even though I’m sure he wouldn’t mind). Speaking of Mr. Tennisballs himself, Squidward was done no justice with his first rendition as a minifigure. Though it’s hard to blame Lego for this one as Squidward has some features that just can’t work on a flat surface (that large schnoz, for example). 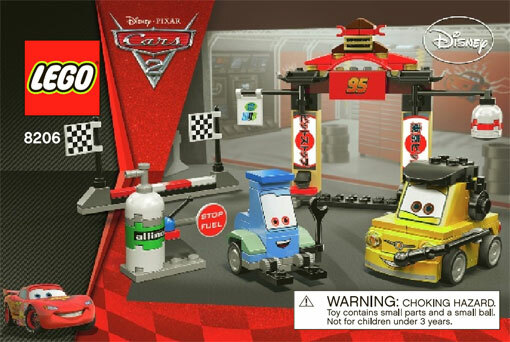 But where this set gets weird is for the fact that Lego chose to make one of the most iconically angry characters in a cartoon smile. You have better chances of surviving falling into a volcano while simultaneously winning the lottery than seeing Squidward smile—so how did Lego mess this up? I can’t tell you how many times I tried to make a roller coaster out of the random assortment of Legos that my Mom kept picking up from garage sales. No matter what I did it just never panned out, and there weren’t any coaster sets. After a while, I just gave up. Enter what is, to me, easily one of the coolest things since sliced bread: an actual Lego roller coaster set! Boy, was I gushing when I discovered this one... plus, it works, making this set one of the greats. Sure, there are plenty of vehicles in the new Star Wars movies that look a little weird. But this one definitely takes the cake, not only for its design but for the fact that no fan should actually recognize it since it wasn’t actually featured in the movie. The Heavy Scout was intended to be in the film, but was cut in the end and now you won’t even see it in the background of a scene. So if you see a Lego set still on the shelves after the holiday season, you can put money on it being this one. Being someone born and raised in the States has shown to have one glaring drawback; that, of course, being that I’ve never gotten to experience the pure ecstasy of going to a soccer match. You know, one of those matches where the police get involved and fans parade out in the streets breaking everything in sight. It seems even Lego seems to know what I mean as seen with this set. This set was supposed to advertise the World Cup, and in a way, I guess it did, just in a way that you would never expect Lego to do. Okay, so I’m as far from being a car guy as you can possibly get, but even I thought that Lego’s version of a Bugatti was easily one of the coolest sets I had come across when forming this list. I mean, you already got the coolest toy in Lego combined with what is one of the most internationally popular cars in the world, you can’t really go wrong here. Well, you can go wrong with the price, as this thing sells for $350... but at least it isn’t reaching real Bugatti prices. Lego’s medieval sets are perhaps one of their most underrated, as it’s such an interesting, yet niche period in time that is just begging to be turned into Legos. So with that being said, there’d have to be a lot going against a set for me to put it on this list—enter the one we have here. It would seem knights discovered the power of flight thousands of years before the Wright Brothers... go figure! Obviously Lego sets don’t have to be that historically accurate, but this is just plain hilarious. Man oh man, is this one something else. It makes you wonder just what kind of headspace the creators of this set were in. Like, did they just finish listening to the Beatles Revolver album, or even weirder, some of Captain Beefheart’s Trout Mask Replica? Regardless of what they were into, what we do know is that they were responsible for making one of the weirdest sets on this list. If this is their idea of a space station, then I guess I’m Neil Armstrong. This is where Lego goes from being a cool toy for children to something holy meant for the Gods. Don’t get me wrong, it’s any kid's dream to play with a Death Star that’s also packed with some of the greatest characters ever conceived. But don’t even introduce me to the kid that can afford this lofty price tag of $500 (if you do meet this kid, ask him if he’s cool helping me out with my loans). There are 4000 pieces, 23 minifigures, and one set that stands above all the other in the Star Wars series. While I’d pretty much be happy receiving any Lego set under my tree, even all of the weird ones, this is something that I’d avoid like [insert cliché here]. Lego Znap is truly something else when it comes to weirdness. These sets are just so bleak in terms of design—like, it feels as though these were toys designed to entertain children in the 1700s. This is really Lego’s true low point in terms of design because these things really just boil down to a few rods stuck together on some wheels. So this set obviously has its ambitions set high for incorporating audio technology and Lego, but that’s really the only praise we can give this thing. And we do say thing, because can anyone honestly tell us what this is?! Is it a bug? Maybe an angry frog? Or maybe some mutation of the two that for some reason comes with recording technology? Seriously, if their plan was to make an audio recorder, why use this abstract beast-like creature? The world will never know. Here we have a movie, and a Lego set, that I could probably talk anybody's head off for how stunning each of them is. And to top it off, this Lego set represents one of the absolute best moments in the movie (even if it is a moment that everyone always talks about). I just can’t get over how perfect this set is—the expression on the minifigures' faces, and the fact that the claw actually works; absolute perfection from brick to brick. And my mind’s still being blown even realizing that Lego has the Toy Story license. If there’s one way to remember all the fun and joy of Toys “R” Us it’s with a disembodied Geoffrey the Giraffe. What was created as a promotional set for Toys “R” Us is easily one of the weirdest and most questionable sets on this list. What do you even do with one of these things? Well, Lego attempted to fix their mistakes on the previous set by releasing a more modern take on Geoffrey, a more refined take, have you. And boy oh boy did it fail spectacularly! Geoffrey has probably never looked any worse ever. This is just defamation of character at the very least—they even found it fit to give him buck-looking teeth! Poor Geoffrey, you don’t really get any lower than creepy unibrow giraffe covered in stars hanging out with kids. But let’s end this thing off right (even though deep down I do want to leave you with the image of that broke down giraffe). Ending us off is the Lego Simpsons house set, which has likely caused you to eye your wallet at least a few times. This is why we love Lego: for creations like these that masterfully combine substance and toy to create something beyond our wildest fantasies. I’d give back all my Christmas presents (well, besides my Ren And Stimpy socks) if it meant getting my hands on this masterpiece.